« First PhDrinks of 2019! Join the legendary party of the year!! It’s time to celebrate and dance until your shoes catch fire! 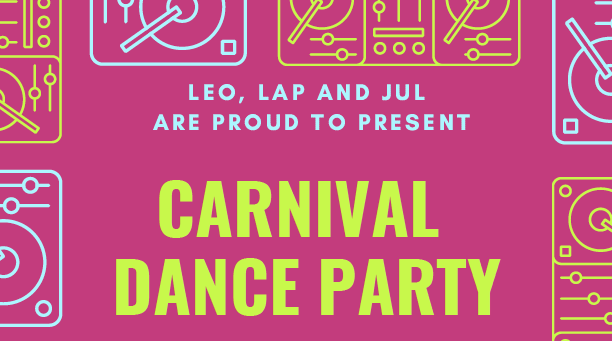 This year LEO, LAP and JUL are teaming up to you a Carnival party, in a great location, the Visbrasserie de Poort! The party will go from 20h30 till 01h00, join us with your best carnival look! As we put all our efforts in to give you an amazing night, the ticket price is 8E including two drinks! Note that this year all PhDs, but also PostDocs and staff members of the university (through JUL) are welcome to join! You can buy ticket online using this link: https://www.ticketkantoor.nl/shop/LLJ-dance-19 , or by scanning the QR code on our posters/flyers. We are looking forward to party with you all!